If you were a Civic Park kid, you probably spent some time on this merry-go-round. I'd forgotten how it dipped toward the ground if you got too much weight on one side. This is a Civic Park School end of the year party back in the days when liability issues weren't such a big concern. The great photo is courtesy of Flint Expatriate John Mucha. Great photo! What year is this? It's June 1967...almost 43 years ago. what an incredibly care-free time!! A simply splendid slice of americana! If this is Civic Park Elementary? Then this photo was taken right before the tipping point. The parents of these kids had their home values plummet. If you google Civic Park School FLint, and then navigate to street view, you can see that the school is now boarded up, and there is literally a drug deal in-process caught on camera! What a disaster! Thank god for photos like this. They tell it like it was... a much better place... a much better time. Anonymous, if you search for "Civic Park" and "Haskell" on the blog you'll find a lot of other posts about the area you might enjoy. Lots of info on this neighborhood. I should add that this is the playground of the Haskell Community Center, a few blocks south of Civic Park School. OMG yes I remember that dip, it would scrape the ground on that side if it went too slow. This blog is blowing my mind with all the memories. Thanks a lot Gordon. 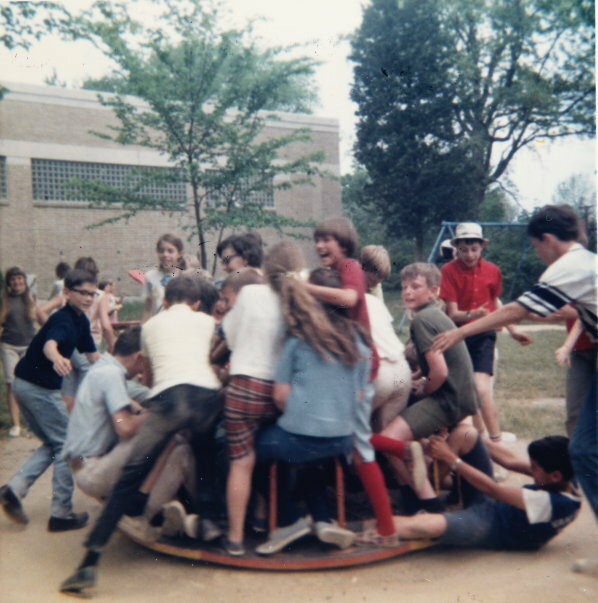 I remember piling on with the kids just like the picture and the game was knocking others off and conversely trying to get on and stay while it was spinning. A couple of kids would usually keep it going so fast the centrifugal force would send you flying if you let go. Talk about liability, I went home more than once bruised, sprained or near concussion. How fun! That neighborhood was the best! Everything you needed within a few blocks. If you Google Flint Civic Park School you actually get Dort Elementary on the map, oddly enough. Neither of them are boarded up last I saw, and what drug deal? Perhaps not unlikely, but how sure are you? The Civic Park School I knew of was on Dayton, not at the link provided above. Ah, yes. That's not Civic Park. Google Maps error! Can't remember what that school was called, but I passed it en route to my grandma's house from Civic Park. I thought that was wrong. I looked for the corner of Forest Hill and Forest Hill, then zoomed in to see the school complex on the aerial view. My mom has just informed me that it's Dort School that is erroneously identified as Civic Park School on Google Maps. Not sure if Dort is still open. A guy leaning in a car isn't necessarily a drug deal. Dort School isn't open anymore, FYI.